On May 13, 2017, Patrick Wiggins, public outreach educator for the University of Utah's Department of Physics & Astronomy, and NASA solar system ambassador to Utah, spotted something unusual in the sky. He was looking at the spiral galaxy NGC 6946, known as the Fireworks Galaxy, in the Cygnus constellation over 22 million light-years away from his telescope at his home near Erda, Utah. He noticed a bright spot that he hadn't seen before. By comparing what he was seeing with earlier photographs taken of the same galaxy, he realized he was witnessing a star explode. He had just discovered a supernova. Named SN 2017eaw, Wiggins' discovery was confirmed on May 14th by two experts in supernovae; Subo Dong at Peking University, and Krzysztof Z. Stanek from Ohio State University. When a star goes supernova, it is one of the largest, most impressive astronomical events in space. A supernova occurs when a massive star collapses in a brilliant explosion that can outshine entire galaxies. This can happen in two ways; when a smaller star burns through its nuclear fuel, the core loses the energy to push against the gravity relentlessly pulling the star inward. If the weakened star gains mass from a star orbiting nearby, the core will collapse due to the overwhelming gravitational force in an event called a Type I Supernova. When a massive star many times larger than our own sun runs out of nuclear fuel, the star's core collapses from its own staggering gravitational forces and explodes in a Type II Supernova. In both cases, these supernovae are astoundingly bright for a time—bright enough to be seen by amateur and professional astronomers alike—until they expend their energy and the light begins to fade over the next few months. SN 2017eaw has been confirmed to be a Type II supernova. This is the third supernova discovery for Wiggins. In 2015, he discovered SN 2015Q in the NGC 3888 galaxy in Ursa Major, and in 2014 he independently discovered supernova SN 2014G, along with Koichi Itagaki in Japan. 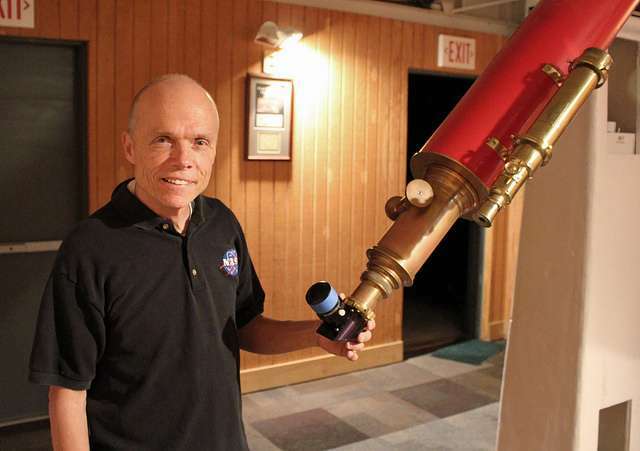 In addition, Wiggins has discovered a whole host of astronomical events in space, including an asteroid in 2008, which the International Astronomical Union named Univofutah, at Wiggins' request, to honor the University of Utah. Wiggins' work has earned him many accolades, including the prestigious Distinguished Public Service Medal, NASA's highest civilian honor. You can meet Wiggins and the rest of the Phun with Physics scientists during free days at the Natural History Museum of Utah.